The example below shows the service C-E-Mail ( Vessel: C-E-mail ; please excuse our accounting system shortcoming). 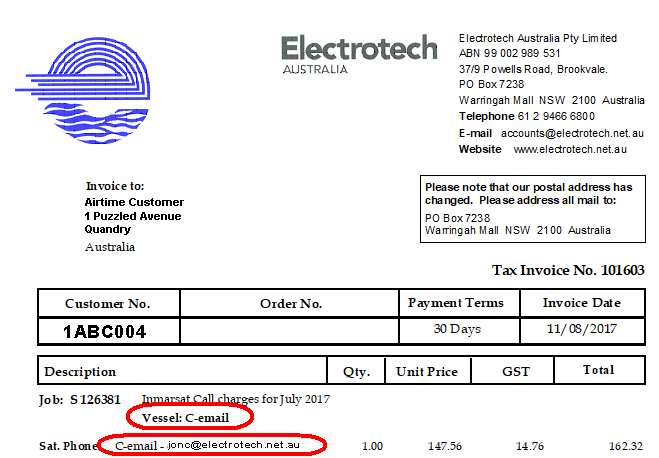 Below that the actual shoreside e-mail address registered for the service is shown ( jonc@electrotech.net.au in this case ). Please note this service enables registered shoreside e-mail addresses to send e-mails to shipside standard or mini-C equipment. It is a shore-to-ship e-mail service (ship to shore direction is an integral function of the Inmarsat equipment and requires no additional registrations).